This 1900 sqft 3BR features a 400 sqft private terrace. Appointed with outdoor furniture and barbecue grill, the terrace is ideal for outdoor eating and entertaining. It offers privacy and tranquility among potted plants. From the apartment’s private, street-level entrance, a carpeted staircase leads one flight up to the main floor, where you’ll enter into the large open floor plan of the living and dining rooms. Also on this level are the master bedroom, full bathroom, additional WC, kitchen, and utility room with washer/dryer. Two additional bedrooms and a full bathroom are located on the level above. The living area features a white leather couch and chairs that are arranged around a rustic coffee table and face three sets of French doors that open onto the terrace. The large windows, columns, and floor-to-ceiling bookshelves give the main salon a dramatic height and airiness. Around a corner you will find another seating area on a raised platform. With a large sectional sofa in lavender and playful décor, this room provides a small television nook that is separate from the main salon. Consistent with the red and white motif of the main salon, the dining area has large wood table with seating for eight in comfortable red dining chairs. This space also doubles as a library and offers a built-in desk that can serve as an office space. A curved shelving unit in the corner contains sliding doors that open to additional storage. 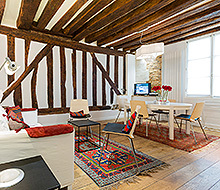 The kitchen, which opens onto the terrace, has a charming, French country feel. It features a corner eating area with cushioned wrap-around seating, a cooker with gas oven, original wood floors, and small skylight and windows. The master bedroom is on the first level and is accessed from the living room along a corridor lined with books, which also provides a small reading bench. Decorated in soothing neutral colors, the bedroom has a walk-in closet, plush blue velvet side chair, and also opens onto the terrace. Upstairs on the second floor (US third floor) are two more bedrooms with windows overlooking the terrace. One contains a queen-sized bed and is decorated in soft lilac and white, and the other is a perfect bedroom for children. Painted in cheerful yellows, it has two twin beds (one with extra large trundle), a crib, writing desk and chair. Both full bathrooms provide a bathtub, shower, washbasin and WC. Both also feature white counters and walls with wood floors; one with black accents and one with wood accents. Gorgeous place. Very big and airy. Huge kitchen fit for family gatherings. The main living room has 2 seating areas plus a dining room table. The master bedroom is huge a big closet and extra wardrobe and sets of drawers. Great bathrooms. Very deep tubs that might be a challenge for older people. The two upstairs bedrooms are a nice size. Would rent it again in a heartbeat when we’re traveling with the family. Location is incredible. On the Rue Rivoli, right in the middle of everything. 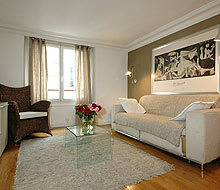 The Paris for Rent team met all our needs and was extremely helpful before and during our stay. The apartment was exactly as advertised and made for a wonderful trip. I can't say enough about the PFR staff, so helpful and accommodating. The apartment is beautiful and in the heart of everything. Even though you are on a bustling and busy street, the apartment is quiet and comfortable. It was more than well-equipped in the kitchen and baths. Thank you Pat and PFR team! 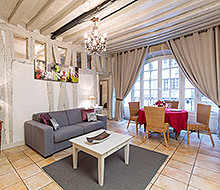 Beautiful apartment in an excellent location. Our family of 5 enjoyed the modern living spaces - especially the outdoor terrace.I will never forget my morning jogs along the Seine with the Eiffel Tower as a backdrop. This apt is beautiful and the location is stellar! We had a 7-day girl trip with 3 moms and 3 16-year old girls..plenty of comfy beds, good baths, excellent kitchen and very secure. The shopping, restaurants, and sights were within walking distance and the area is beautiful. We would positively give this 5 stars! Would definitely stay here again.